Our vacation last week holds a lot of Perfect Moments. I'll share them with you over the next couple of weeks. This year's vacation was to include the entire family to celebrate my parent's 50th wedding anniversary. 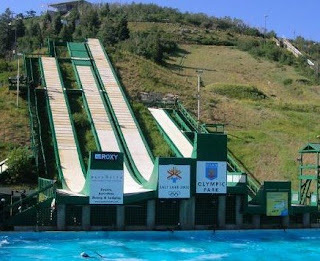 At the start of our trip, we went to Olympic Park near Park City, Utah to watch an exhibition for freestyle skiers. During the summer, the athletes practice down ramps covered with an astro-turf type material, sprayed with water. To help pad the landings, they land in a pool with bubbles aerating the water. Check out this video for an example of how it works. My DH and three sons and my younger sister all signed up for a freestyle skiing camp. They warmed up with various activities like walking a balance beam, getting suited in wetsuits, skiing down a hill, jumping off a small tramp into the water, and then progressing to a practice ramp into the water. Even though it was scary, they all did it several times and really had a great time (even DH and sis). One of the things the safety video mentioned and the instructors reinforced was that an athlete would need to do a jump-turn to take the skier from perpendicular skies on the hill to point them downhill...if they wanted to progress to the steeper, longer ramp. My middle son, B, (one of the twins), kept talking about it and trying his jump turn. Finally he got it and asked the instructors if he could go on the big hill (the next step up). I jumped up from my chair as I watched him climb the stairs up about 200 feet to the steep ramp. He positioned himself perpendicular to the hill and looked down at the ramp. From his vantage point, I imagine it looked like a steep hill with a ramp off the end, into a large pool. To get an idea of how steep it is, check out the ramp on the far right in the picture above. What you don't get with the still photos is his mother (me) yelling, screaming and whistling to let him know how proud I am of him! I am proud of all of my family athletes, DH, sis and my three boys. Awesome! My goodness ... those pics are amazing!! I took one look at your photo and thought, you HAVE to be Lori's sister! (I am her Australian sister, heh). What amazing pictures! You really captured it! This looks fun, exhilarating, and scary all at the same time. Wow. You must have felt so many things as you watched B perform his feat. Yay for all of you! What awesome memories. And now, we have Edenlyn! That looks like sooo much fun! I would totally do it. Three times! What a champ. Wow! That was incredible and brave to go down that. Just found your blog through A Sense of Humor is Essential and had to comment! Wow! Those are amazing shots! Perfect Moment Monday -- Hang on!